Turkish list of flotilla soldiers a sham? Names recycled from Operation Cast Lead? The Turkish media called a list of 174 names of soldier and security officials allegedly connected to the IDF raid on the Gaza-bound ship as "extremely valuable," but a deeper examination reveals that the IDF personnel appearing on the list have no direct link, if at all, to the flotilla raid. The list is headed by former IDF Chief of Staff Gabi Ashkenazi, Navy Commander Eliezer Marom and former Commander of IDF Intelligence Branch Major General Amos Yadlin, but the rest of the names are of soldiers who already completed their military service at the time of the 2010 raid. Among the 174 names listed, many belong to low-ranking officers and soldiers who had nothing to do with the raid, such as a Golani maintenance officer, a Paratroopers' company command and an Artillery battery commander. According to the report in Turkish media outlets, "almost all the soldiers who killed the nine activists and injured 30 people were identified," but the Turkish government denied ever asking its National Intelligence Organization (MIT) to confirm the identities of Israeli commandos involved in the raid. Istanbul's deputy prosecutor said that a lawyer for the IHH submitted a list of soldiers' names to his office and said it will be examined. 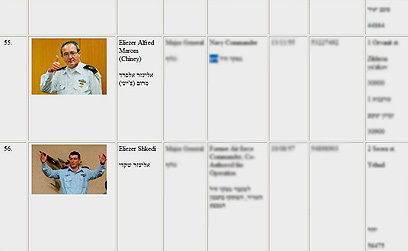 The IDF Spokesperson's Office stated in response: "After examining the reports in the Turkish press, it is clear that the names do not belong to soldiers who were involved in the Marmara raid incident, but were rather recycled from previous lists that were published on anti-Israeli websites following Operation Cast Lead. "The IDF and the relevant governmental offices are closely following these attempts to launch legal proceedings against those who acted on behalf of the State of Israel as part of its war on terror, and are taking the necessary steps," the statement said. Military officials noted that the report is part of a psychological warfare conducted by the Turks, following Israel's refusal to apologize over the flotilla raid and in wake of the Palmer Report, which recognized the legality of the naval blockade on Gaza. See all talkbacks "Turkish list of flotilla soldiers a sham?"